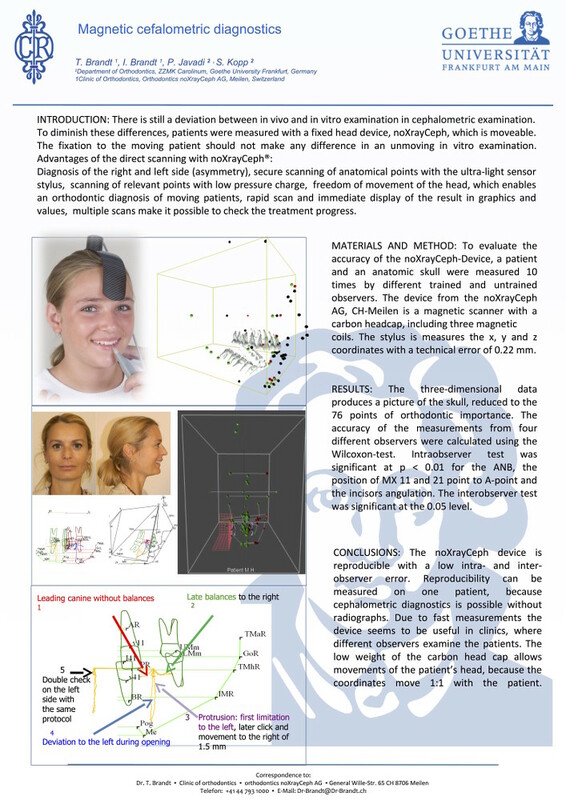 Diagnosis of the right and left side (asymmetry), secure scanning of anatomical points with the ultra-light sensor stylus, scanning of relevant points with low pressure charge, freedom of movement of the head, which enables an orthodontic diagnosis of moving patients, rapid scan and immediate display of the result in graphics and values, multiple scans make it possible to check the treatment progress. 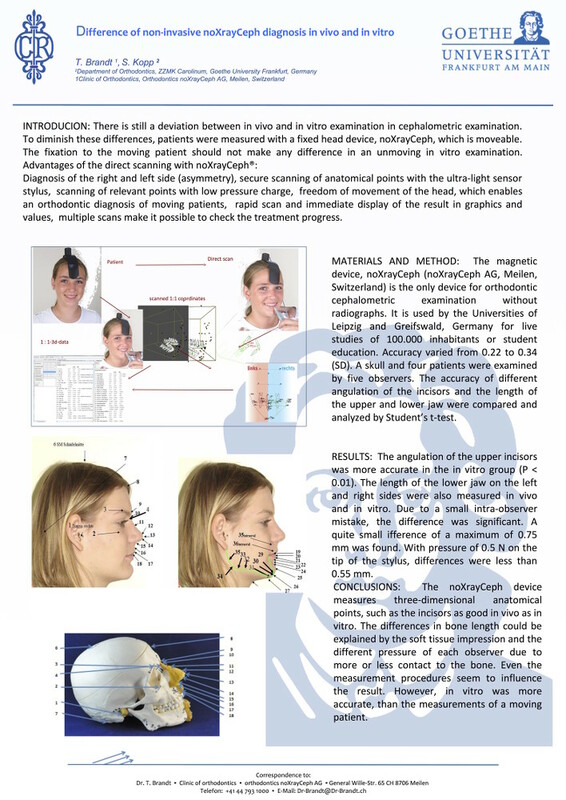 MATERIALS AND METHOD: To evaluate the accuracy of the noXrayCeph-Device, a patient and an anatomic skull were measured 10 times by different trained and untrained observers. The device from the noXrayCeph AG, CH-Meilen is a magnetic scanner with a carbon headcap, including three magnetic coils. The stylus is measures the x, y and z coordinates with a technical error of 0.22 mm. RESULTS: The three-dimensional data produces a picture of the skull, reduced to the 76 points of orthodontic importance. The accuracy of the measurements from four different observers were calculated using the Wilcoxon-test. 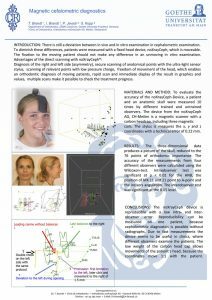 Intraobserver test was significant at p < 0.01 for the ANB, the position of MX 11 and 21 point to A-point and the incisors angulation. The interobserver test was significant at the 0.05 level. CONCLUSIONS: The noXrayCeph device is a reproducible with a low intra- and inter- observer error. Reproducibility can be measured on one patient, because cephalometric diagnostics is possible without radiographs. Due to fast measurements the device seems to be useful in clinics, where different observers examine the patients. The low weight of the carbon head cap allows movements of the patient’s head, because the coordinates move 1:1 with the patient. 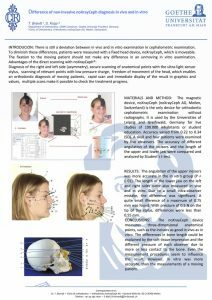 MATERIALS AND METHOD: The magnetic device, noXrayCeph (noXrayCeph AG, Meilen, Switzerland) is the only device for orthodontic cephalometric examination without radiographs. It is used by the Universities of Leipzig and Greifswald, Germany for live studies of 100.000 inhabitants or student education. Accuracy varied from 0.22 to 0.34 (SD). A skull and four patients were examined by five observers. The accuracy of different angulation of the incisors and the length of the upper and lower jaw were compared and analyzed by Student’s t-test. RESULTS: The angulation of the upper incisors was more accurate in the in vitro group (P < 0.01). The length of the lower jaw on the left and right sides were also measured in vivo and in vitro. Due to a small intra-observer mistake, the difference was significant. A quite small ifference of a maximum of 0.75 mm was found. With pressure of 0.5 N on the tip of the stylus, differences were less than 0.55 mm. CONCLUSIONS: The noXrayCeph device measures three-dimensional anatomical points, such as the incisors as good in vivo as in vitro. The differences in bone length could be explained by the soft tissue impression and the different pressure of each observer due to more or less contact to the bone. Even the measurement procedures seem to influence the result. However, in vitro was more accurate, than the measurements of a moving patient.